I'm sensitive to Thanksgiving traditions. We normally have Thanksgiving with my husband's extended family, and every other year (more or less) it's at our house. A few years back when we hosted, we invited some friends to join us, a young couple living far away from their East coast families. I asked if there were any foods they really needed to make it feel like Thanksgiving at home. Scalloped oysters, they said. I had never made oysters before and was quite relieved to find them pre-shucked at a local fish market. My Hungarian in-laws were puzzled when the oysters appeared on the table, but our friends told me later how much they appreciated the gesture. I think everyone has must-have foods at Thanksgiving. Personally, my Thanksgiving is incomplete without green bean casserole. I prefer the original (dare I say authentic? authoritative?) version made only with frozen Frenched green beans, full-fat Campbell's condensed cream of mushroom soup, and those naughty canned fried onions from the grocery store. But in a nod to the modern foodie I've become, I made this version of green bean casserole last year with fresh green beans, caramelized onions and sauteed mushrooms. Some things remain the same: I still use canned condensed soup and fried onions, although I seek out the trans-fat-free onions from Trader Joe's. But that's just me. If you prefer to make your own mushroom cream sauce, feel free. I'm sure it will be delicious. Just make sure it's on the thick side or the casserole will be too runny. You want it to feel a little tiny bit like glue in your mouth. That's the way it's supposed to turn out. Bring a large pot of water to a boil. Drop in the green beans and blanch them 4-5 minutes, until the beans are softening but have not turned mushy. Drain and place the beans in a large mixing bowl. Heat the oil in a large saucepan and saute the onions and mushrooms until they are softened and golden brown. Add the vegetables to the green beans in the bowl. To the mixing bowl, add the cream of mushroom soup, fried onions, milk, and lots of pepper. (You won't need to add salt; the soup and the fried onions are salty enough.) 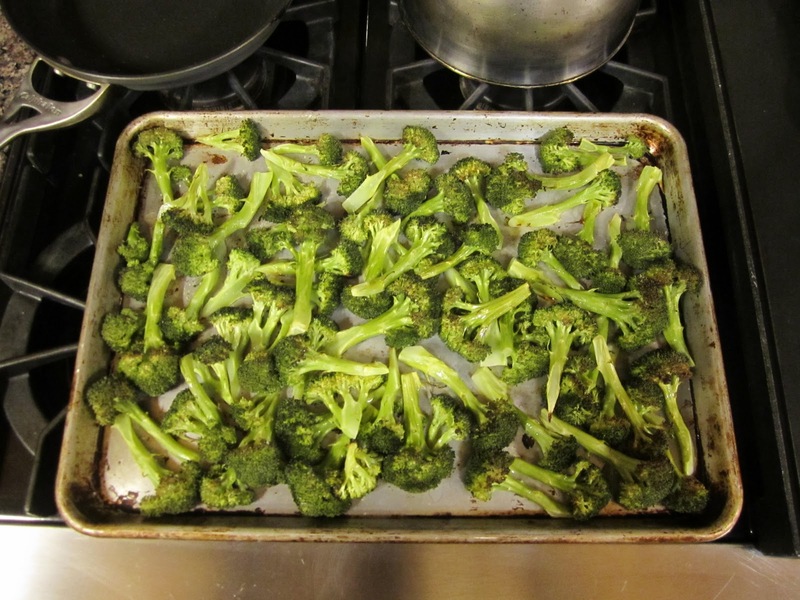 Mix thoroughly, turn into a casserole dish, and bake 40 minutes, or until the casserole is bubbling. Serve hot. 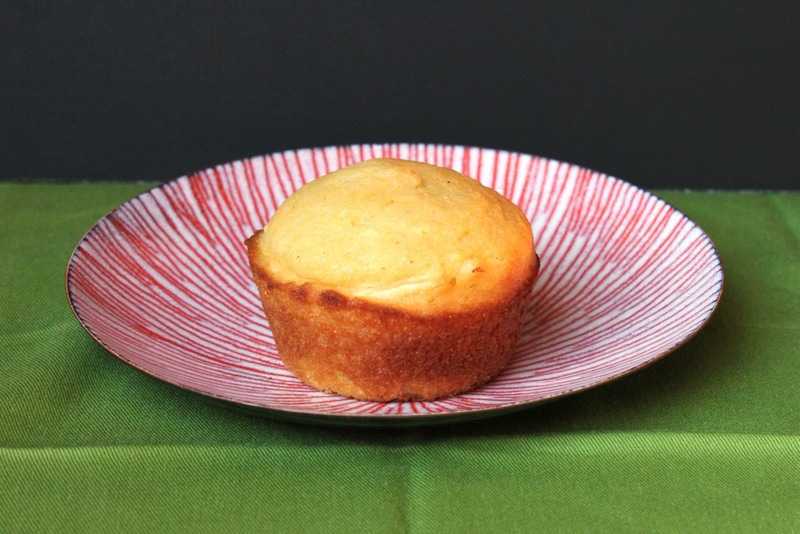 I cannot look at a corn muffin without thinking about my dad. Most Sunday mornings I would go to work with him. He was a pediatrician in the days when there was no such thing as a "quick strep" test, and throat cultures were done in the office and grown out over 24 hours in a little incubator at the nurses' station. On Sundays he would go to the office, read the throat cultures, call in prescriptions for the kids who had strep and needed antibiotics, and see a few kids whose desperate parents called after a sleepless Saturday night. I would sit at the front desk, answer the phones, doodle on notepads, play with the typewriters, and pretend to be a grownup. When we were done my dad and I would stop at the diner for pancakes (me) and a toasted corn muffin with grape jelly (him). Greek diners are a huge part of my East coast heritage. Those of you who have ever lived on the East coast will understand. In fact, the Majestic Diner in Westbury, New York, is the first place I want to go when I visit my mom and the last place I fill up before heading back to the airport. Spanikopita the size of a dinner plate. Roast chicken with a side of stewed dandelion greens. And sometimes, when I'm in the right mood, one of those big, sweet corn muffins, split, griddled, and slathered with butter and jam. My dad passed away two years ago, but every time I eat a corn muffin I can feel him licking his lips nearby. As a kid I found cornbread and corn muffins a little dry. This might have been because my mother did not believe in butter. (Yes, really.) As I learned later, with butter, cornbread is positively intoxicating. I love its sunny yellow, the crunch of the cornmeal, and the sweet smell of warm corn. I've taken to adding grated apples to my cornbread to make it even more moist. 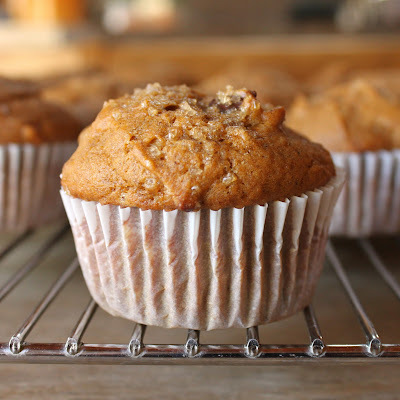 This is good baked in a skillet or cake pan, but I like muffins: individual servings, fewer crumbs. 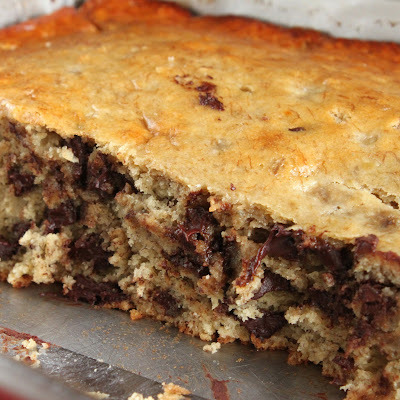 If cornbread is part of your Thanksgiving, you'll love these. Just be sure to put a butter dish on the table. Preheat oven to 350 degrees. Spray a 12-cup muffin tin with nonstick cooking spray. In a 2-cup glass measuring cup, pour the milk, then add the butter. Microwave the milk mixture on high for 30 seconds; stir, then put it in for another 30 seconds. The milk should be warm enough to melt the butter by now, but don't heat it too much - you'll see why in the next step. Stir until the butter is melted. Add the egg and beat with a fork to combine. If the milk is too hot, it will cook the egg, which you definitely don't want to do. Whisk the milk mixture into the cornmeal mixture just until combined. Stir in the grated apple. Divide the batter evenly among the 12 muffin cups, which should fill each about 2/3 of the way up. Bake about 20 minutes, until a tester comes out clean. Tender, rich, savory beef short ribs. 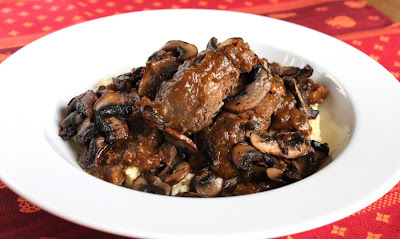 With lots of meaty crimini mushrooms. In a sauce that, if I hadn't told you, you'd never guess included pure pumpkin puree. 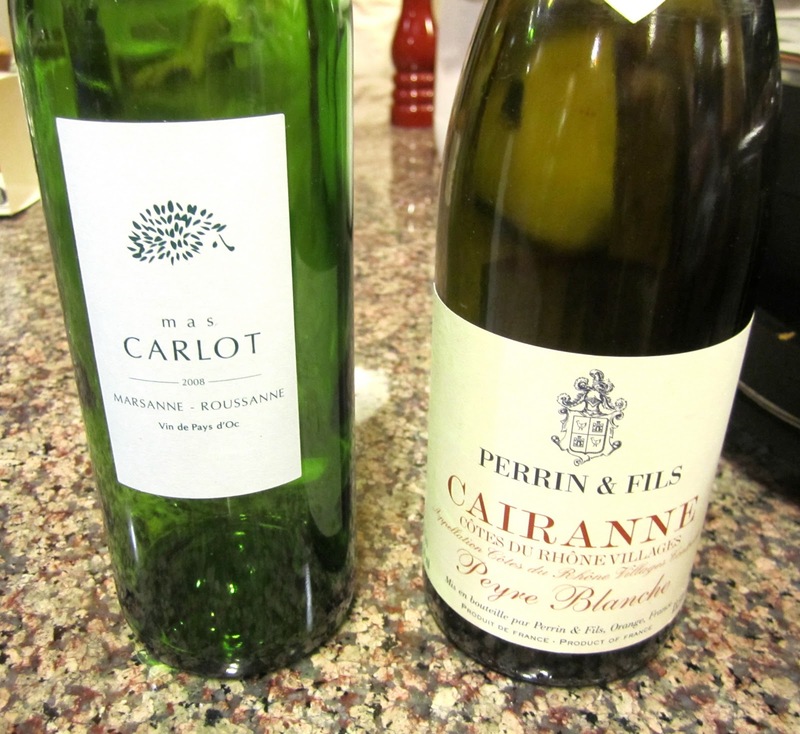 Oh, and those heavenly aromatics? My secret spice drawer weapon: Chinese five spice powder. It's a traditional combination of fennel, cloves, cinnamon, star anise and white pepper. Buy some. 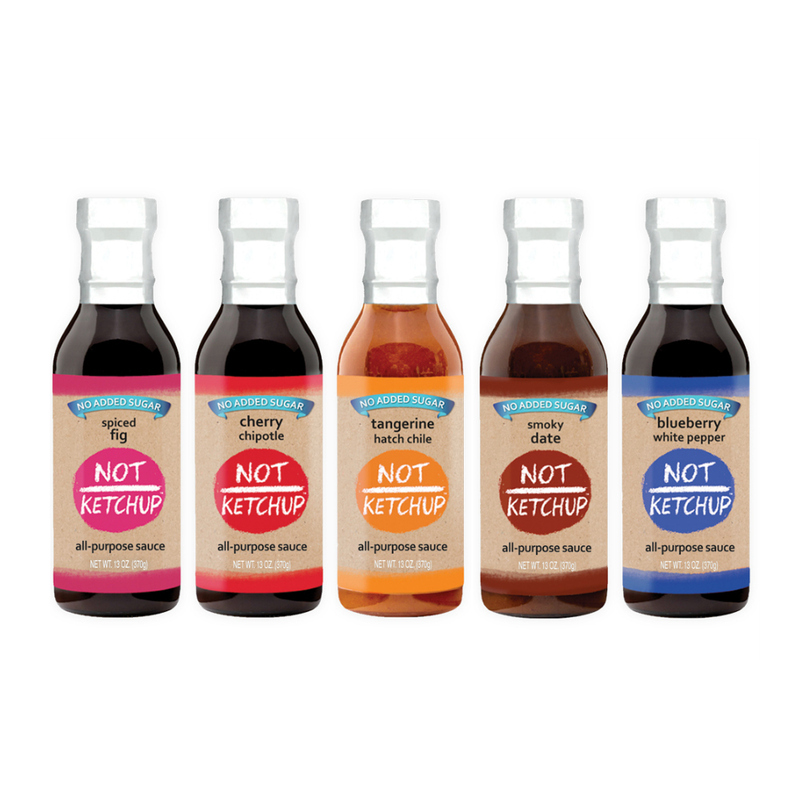 Use it with everything from beef to chicken to chocolate. It will rock your world. Between the pumpkin and the aromatics, this stew tastes the way Vermont looks in October: warm, spicy and full of oranges and golden yellows. Yes, you can taste orange and gold. Close your eyes, inhale, and take a bite. You'll see what I mean. I've made this both in the slow cooker and on the stovetop. I've included directions for both, so use whichever method fits your schedule. I like English-cut short ribs - they're well marbled and boneless, and my local Costco sells them in large packages - but bone-in short ribs would work fine too. In a large, heavy pot, heat the oil over high heat until just starting to smoke. Brown the short ribs in batches on all sides, removing each batch to a plate as you finish it. When the meat is browned and out of the way, add the onions to the pot. Saute about two minutes, until they start to wilt and turn golden. Add the mushrooms and continue to cook over high heat until they are cooked and have given up all their water, about 6-7 minutes. Add the garlic and stir briefly. Pour in the wine; it will bubble and evaporate quickly, which is what you want. 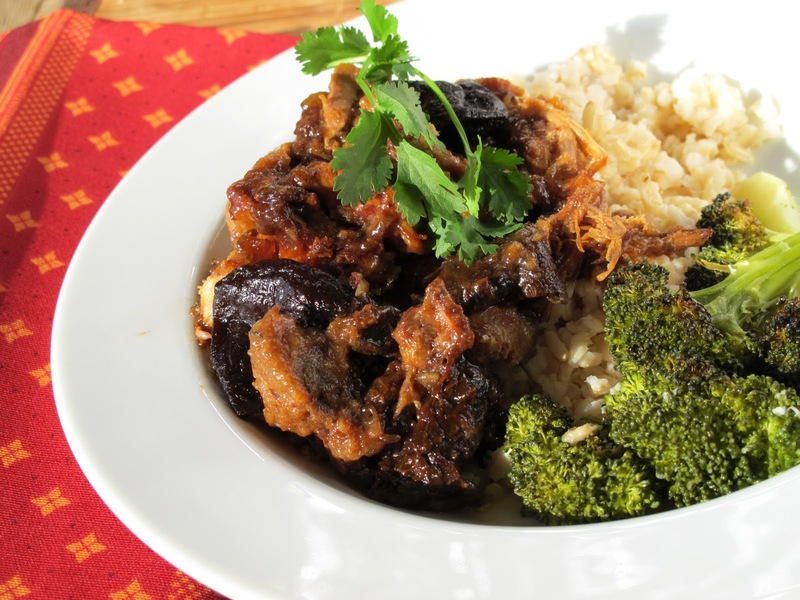 Slow cooker: Add the beef, onion mixture, pumpkin puree, beef broth, spices and salt to the pot of the slow cooker. Cook on low 8-10 hours. Your house will smell unbelievably good. Stovetop: Add back the meat to the pot, then add the pumpkin, beef broth, spices and salt. Bring to a boil, then turn the heat down to low, cover the pot, and cook over low heat at least three hours, or until the meat is fork tender. Inhale often as the short ribs are cooking, and smile. Serve hot over polenta or buttered egg noodles. Listen: Erika on the radio! A few months ago I taped an interview for Good Food, Evan Kleiman's weekly show for KCRW, our local public radio station. 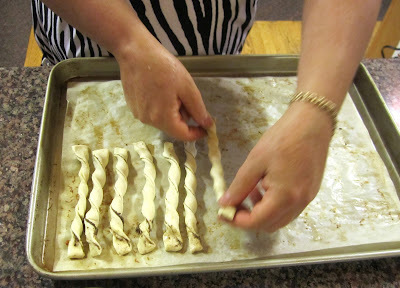 We talked about my Grandma Rose's rugelach recipe, which I've tried hard to recreate since she died. That interview aired this morning. I was fortunate enough to have some of my food blogger friends with me when it aired - thank you Kate, Cheryl, Paulette, Dorothy, Melissa and Linda for helping me enjoy my moment in the spotlight. You can listen to it online - I'd love to hear what you think. How's my radio voice? Click the link below, then click LISTEN to stream it online. My segment starts 8 minutes in, right after the Market Report. The other night I felt like baking. This happens sometimes (by which I mean often) after a long day at work; baking relaxes me. I had apples in the fruit drawer, so I called my friend Judith and asked for her apple cake recipe. She makes it every year for Rosh Hashanah and it's one of her favorites. Unfortunately, at the moment I called, Judith was busy making dinner and couldn't quickly locate the recipe. 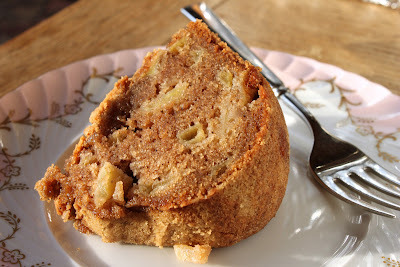 So, while I intended to share with you Judith's apple cake recipe, this isn't it. 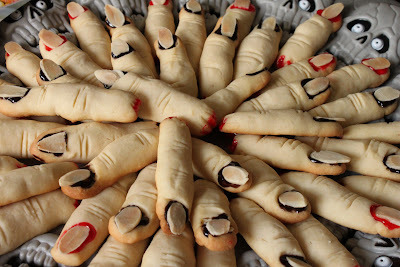 I adapted this recipe from one I found on a blog called The Cookie Shop. Don't worry, though. When I brought this cake into the office the following day and put it in the kitchen, it was gone in - are you sitting down? - four and a half minutes. I've gotten more compliments from my colleagues on this cake than on anything else I've ever made them, including almond and strawberry jam bars, brownies, and coconut rice pudding with loquats. Which just goes to show that the smell of cinnamon brings a crowd to its knees every time. And that feeding your colleagues is an excellent way to make friends in the office. I actually made two cakes. For the first, pictured above, I cut the apples into chunks, as the original recipe specified. For the cake I brought to work, I grated the apples, and I think I'll do it that way from now on. The grated apples kept the cake moist and tender, and instead of biting into distinct lumps of cooked apple, the fruit becomes almost a background flavor. It's your choice, though. Either way, it's a fabulous cake. Preheat the oven to 350 degrees. Spray a large bundt pan with cooking spray. Sift the flour, cinnamon, baking soda and salt into a bowl. 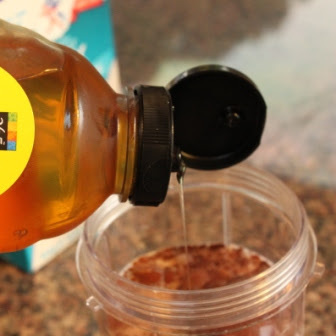 Put the oil, sugar, eggs and vanilla into the bowl of a stand mixer with the paddle attachment. Turn it on and beat the contents until the mixture is lemon-yellow and light, about 4-5 minutes. Turn the mixer to low and gradually add the dry ingredients, mixing only until the flour mixture is incorporated. Add the grated apples and mix briefly. Pour the batter into the bundt pan and smooth the top with a spatula. Bake about 1 hour, or until a tester comes out with just a few crumbs clinging to it. Cool 5 minutes in the pan, then turn out onto a rack or a cake stand to finish cooling. Serve at room temperature. 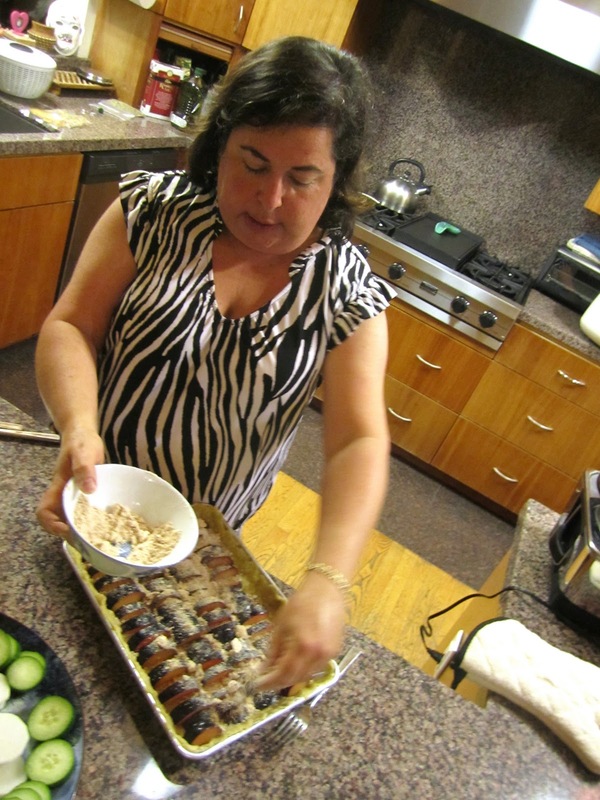 I started cooking and collecting recipes in 1988, when I graduated from college and moved to New York. Banana bread is one of the first things I learned to bake. I know this because of the writing on the recipe card in my steel box. The box has a lot of yellowed clippings from The New York Times and some index cards with my handwriting. I remember the blue Flair felt-tip marker I used to write down this banana bread recipe. The marker lived in a can on my desk in my Upper West Side apartment. 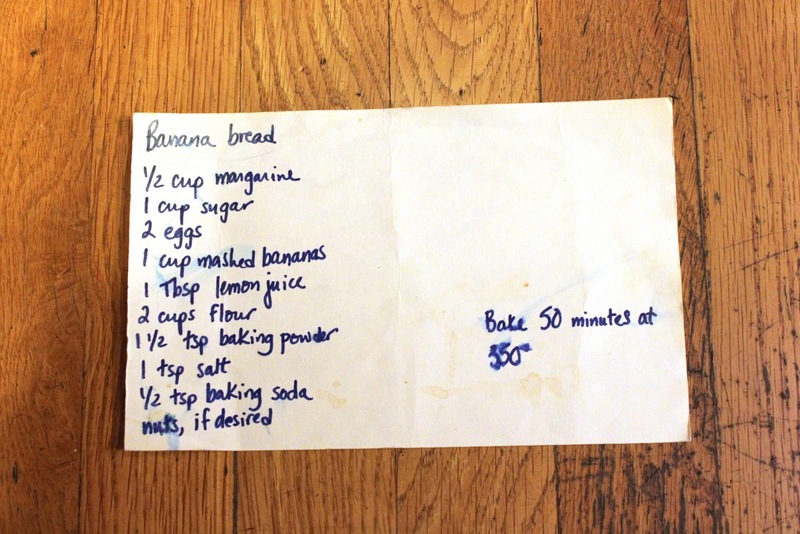 I remember looking at this recipe card often in my tiny galley kitchen. What I don't remember is where the recipe came from, and it doesn't say on the card. But it's a great recipe, very flexible and forgiving. Over the years I've made changes that stuck - more banana, butter for margarine, yogurt for lemon juice. Now I use this master recipe as a base for muffins, cakes and sometimes even cookies. Adding chocolate, by the way, was a change I made only after meeting my husband, a confirmed chocoholic. As far as he's concerned, nothing without chocolate qualifies as dessert. He's a wise, wise man. Preheat oven to 350 degrees. Spray a 9x13 baking dish with cooking spray and set it aside. Put the bananas in the bowl of a stand mixer with the paddle attachment and turn it on for about 30 seconds. The paddle will break up the bananas nicely. Stop the mixer and add the butter, yogurt, sugar and eggs; turn it on again and mix until everything is well combined, about 1 minute. Onto a piece of parchment paper, sift the flour, baking powder, baking soda and salt. Fold up the sides and, with the mixer on low, add the dry ingredients a little at a time, until they are just incorporated. Stop the mixer and remove the bowl from the machine. With a spatula, mix in the wheat germ and chocolate chips. Spread the batter into the prepared baking pan. Bake about 40 minutes, until a toothpick inserted into the center of the cake comes out clean (except for the melted chocolate). Let cool at least 30 minutes before serving. 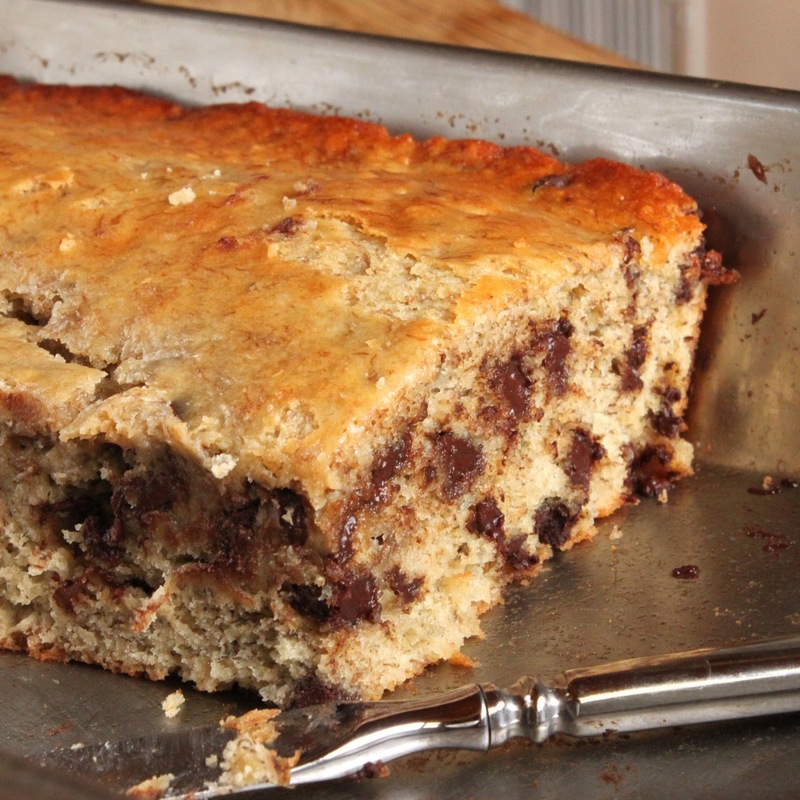 No need to unmold the cake - serve it right from the pan. Today I'm writing about food from a different point of view. This morning, instead of working at our computers in our comfortable Santa Monica office, about 40 people from my company descended on MEND, or Meet Each Need with Dignity. MEND, a nonprofit in a rough part of L.A.'s San Fernando Valley, helps people and families in need with clothing, food, medical and dental care, and educational programs. I spent my time in the food bank with a dozen of my coworkers, where we sorted through bags of donated food and gathered the edible stuff into boxes to be given away to MEND clients. MEND volunteers drive trucks around the valley to pick up donations. Sometimes these are packaged foods past their expiration date, or day-old bread. They get a lot of produce, too, much of which, unfortunately, has already turned the corner, and which, even more unfortunately, is generally mixed in with the good stuff. MEND is committed to providing clients with fresh produce whenever it can, so the volunteers spend a lot of time sifting through soft, rotten fruit to find the edible pieces within the piles. It's hard work, not the easiest job for which to recruit volunteers, according to Luke Ippoliti, assistant director of MEND's food bank. Over dinner tonight I tried to tell my kids about the outing to MEND. I think it was hard for them to empathize, which is certainly not their fault. They've never gone hungry. They've never done without. When they want something to eat, I make it or we buy it. We try not to waste food in our house, but sometimes it happens: Bread molds, fruit rots, milk sours. As I was sorting through bags of discarded food today, I realized that my normal "throw it out" standards didn't apply at the food bank. If it wasn't spoiled, it went into someone's box. Because when you're hungry, soft bananas are better than no bananas. I feel lucky to work for a company that considers it important enough to give back to the world that it's willing to pay a few dozen people to spend a day at a place like MEND. Next time I go, I'm taking my kids. If you live in Los Angeles, MEND needs your help. November and December, leading up to the holidays, are their busiest time. Contact volunteer services director Lupe Martin, (818) 896-0246 x7327 or lupe@mendpoverty.org. They'll put you to work and use your time well. Most of the fish my family eats comes from our local Costco. There is an excellent fish market a few miles away called Santa Monica Seafood, but it moved recently to a new location with inadequate parking, and it's no longer on my way home from work. Unfortunately, that means I rarely get there. I've been pretty pleased with Costco's selection and quality. They often have wild salmon or steelhead. My husband likes the Dover sole. We also buy the large trays of tilapia filets, which I like because they're versatile. Sometimes I flour and pan-fry them, but because they're firm and meaty, often I include them in a stew or soup, like this green fish curry. My eight-year-old wouldn't eat it, but I've given up trying to please him. He's going through a picky period and often prefers a bowl of cereal or a toasted cheese sandwich to whatever I've made for dinner. His loss. More for us. 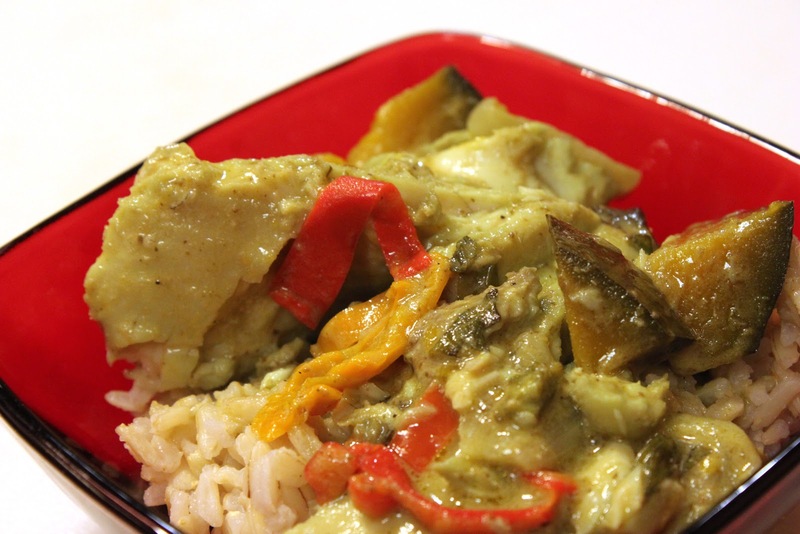 Note: I use a bottled green curry paste I bought at an Indian grocery store. It's different from a thai green curry paste - it's got more fresh herbs (cilantro, mint) and less ginger. I must apologize: I can't remember the brand, threw away the jar and can't find any similar products online to which to link. However, it's relatively easy to make your own - just put cilantro, fresh mint, garlic, ginger, a jalapeno, some olive oil, and lemon or lime juice in the mini-chopper, and that's a pretty good approximation. Heat the oil in a large pot over medium-high heat. Add the onion and bell pepper and saute 3-4 minutes, until the vegetables are softened. Add the garlic and cook 30 seconds, just until you start to smell the garlic. Immediately add the coconut milk, water and curry paste; stir to combine. Add the kabocha squash, bring the mixture to a simmer, and cook covered about 15 minutes, until the squash is tender. Add the tilapia filets to the liquid, cover, and simmer another 15 minutes, until the fish is tender and flakes easily. Stir in the lime juice and chopped herbs. Serve immediately over rice. Chili is always a hit in our house, and we have several favorite recipes. When I'm feeling ultra-lazy I doctor up the version on the back of the chili spice mix envelope and make "Cheater's Chili." When I'm really lucky (as I was this week), Michael makes a batch of his famous chili bianco, a white chili with chicken and/or pork, white beans, tomatillos and cilantro. 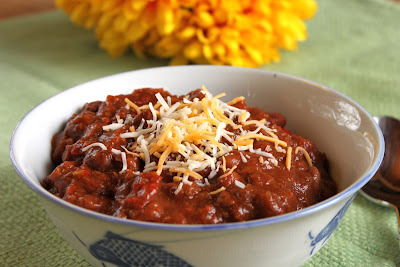 And then sometimes I experiment with variations on the genre, as with this pumpkin chili. When I first made it last year I managed to mistake ground chipotle powder for regular chili powder, and it was delicious but ultra-spicy. This year I got it right. If you prefer chili that takes off the top of your head, feel free to add more spicy stuff. Notes: This recipe can be made either on the stove or in a slow cooker; I've included instructions for both. If you've made a big pot and are wondering how else to repurpose the leftovers, they're a great addition to a chilaquiles casserole or a simple quesadilla. If you're planning to cook the chili on the stove, start with a large pot. 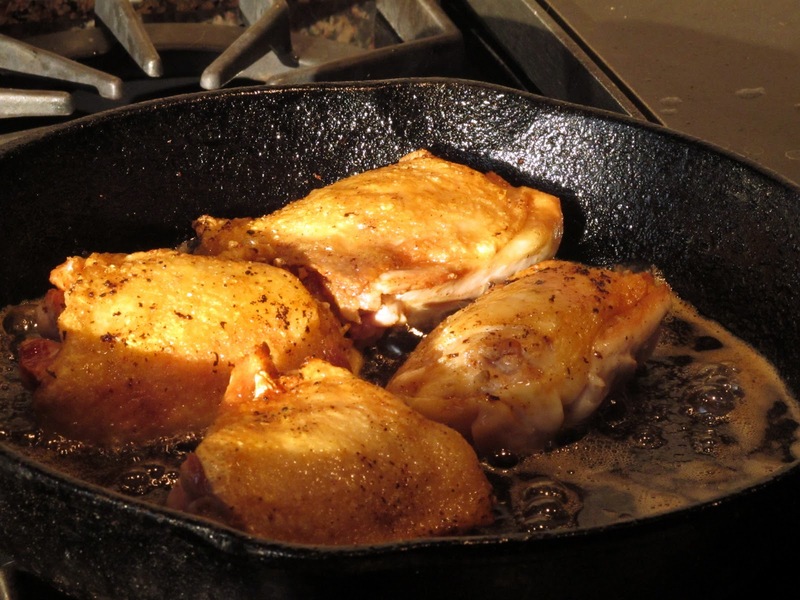 If you're using a slow cooker, start with a large skillet. In the appropriate vessel, brown the ground beef until no pink remains, breaking up the meat with a wooden spoon. Add the onion and bell peppers and saute another 4-5 minutes. Add the garlic and stir briefly. Slow cooker: Put the beef mixture into the slow cooker along with the pumpkin puree, tomato paste, beans, spices and salt; stir to combine. Cook on low 8 hours or on high 4 hours. Stovetop: Add the pumpkin puree, tomato paste, beans, spices and salt to the pot; stir to combine. Bring to a boil, turn down the heat, and simmer covered 2-3 hours. If the chili looks too dry, add a little water. Serve hot, topped with shredded cheese and crumbled tortilla chips. Makes enough for a very large gathering plus leftovers. 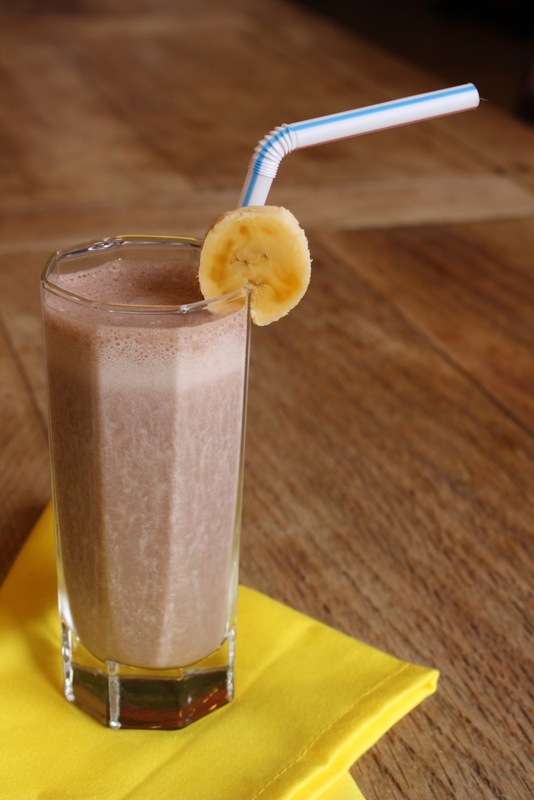 Banana chocolate "milkshake" smoothie - 100 percent lactose-free! We are a smoothie family. More mornings than not, I tell the kids to cover their ears so I can put the little blender on the counter through its paces. It's a great way to get fruit into my kids early in the day (so I can feel less guilty about the cookies they'll likely eat later on). I know lots of people who slip kale, spinach and other greens into their smoothies. I'm not that evolved. I prefer smoothies that are closer to milkshakes - particularly this guilt-free family favorite, in which frozen bananas combine with deep, dark chocolate. 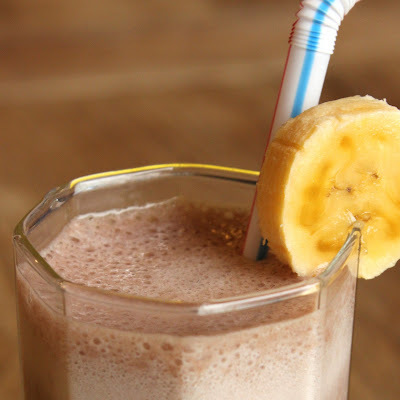 It's healthy enough to serve for breakfast but decadent enough for dessert, and using frozen bananas give it a thick milkshake-like texture. That's my kind of smoothie. This recipe is my entry into a contest sponsored by Moovision.com to attend the Foodbuzz Blogger Festival, so while you can use any milk you prefer for this smoothie, I've used Lactaid lactose-free cow's milk (I received a free sample to create this recipe). I was lactose intolerant for more than 10 years; amazingly, the condition improved when I was pregnant with my older son. During the years I had trouble with milk products, Lactaid milk got me through my daily coffee and morning cereal. It tastes a little sweeter than regular milk, and that makes it even better in this smoothie. Those who can't drink regular milk still need their calcium and vitamin D, which Lactaid provides - the only thing it's missing is the lactose! 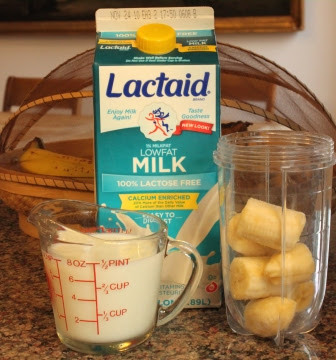 Anyone who has trouble digesting regular milk should give Lactaid a try. You'll also want to take a look at Moovision.com, where you can watch Moo News "mockumentaries," play an online game called Moolah!, and enter the Gourmoo Cookoff recipe contest (lots of great prizes! ), all while learning more about lactose intolerance. By the way, it took my son years to catch on to the fact that there wasn't actually any ice cream in this "milkshake." Now that he's in the know, he makes me call it a smoothie. He still likes it just as much, though. 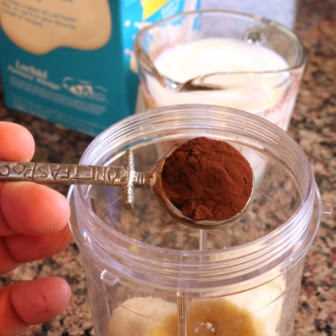 Place all ingredients in blender and blend until smooth. Pour or spoon into a glass (it will be thick). Serve immediately with a straw and a spoon. The finished smoothie - frosty, thick and delicious! How do I love thee, pumpkin? Let me count the recipes. Remember the six-pound can of pumpkin puree my husband brought home? The one that was bigger than my head? I spent all day last Sunday cooking with it. First I made pumpkin beef chili in the slow cooker, which we'll have for dinner tomorrow night (I try to work a few nights ahead). Then I baked pumpkin chocolate chip muffins, which have been quite a hit with the kids. I also made a pumpkin chocolate chip bundt cake to take to a party, but I had a little mishap when I turned it out of the pan: I spaced on the fact that it was a bundt and therefore did not have to be turned right-side-up, and it ended up in a million pieces. So I crumbled it into a bowl, sprinkled it with pear liqueur, layered it with whipped cream, and called it trifle. Lemons into lemonade. Finally, I put up a big pot of this pumpkin soup with red lentils. I love the texture of red lentils, the way they melt into the background. The Thai spice paste and coconut milk work perfectly with the sweetness of the pumpkin - this is a warm, hearty, creamy soup that's healthy and satisfying. It's also vegan, if that matters to you. As for the kaffir limes, they're worth seeking out at a Thai or south Asian market. They've got a very strong smell, almost soapy. Most recipes that include kaffir lime at all use the leaves, not the fruit, but I got the limes from a coworker with a tree, so I thought I'd try them. If you can find them, give it a whirl. If not, normal limes will work just as well. Heat the oil over medium heat in a large pot, then add the onion and saute until translucent, about 5 minutes. Add the garlic and cook another 30 seconds; do not let the garlic brown. Add the curry paste and cook another minute, until the vegetables are coated with the spice mixture. Put into the pot the lentils, pumpkin puree, coconut milk, and water or broth, and bring to a simmer. Cover the pot and cook over low heat about 30 minutes, or until the lentils are soft and falling apart. Puree the soup in the pot with a hand-held immersion blender. If it's too thick, add more water to get it to the consistency you prefer. Stir in the lime juice and lime zest, check the seasoning, and add salt to taste. 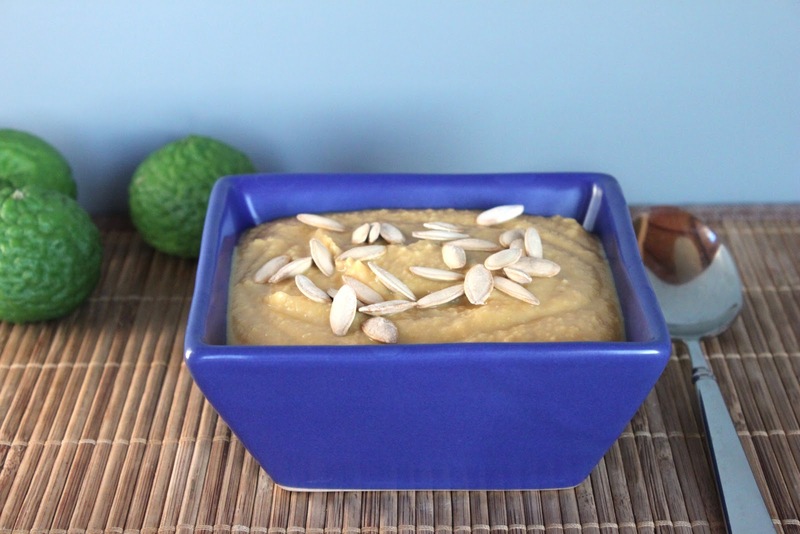 Serve hot, garnished with the toasted pumpkin seeds. It's a typical fall day here in southern California - that is to say, hot and sunny with a cool ocean breeze blowing in from the west. Leaves are turning and falling in other parts of the country, but we're still firmly entrenched in beach weather at my house. Still, the calendar says fall, so I asked Michael to pick up some canned pumpkin. He brought me a six-pound can. It's bigger than my head. 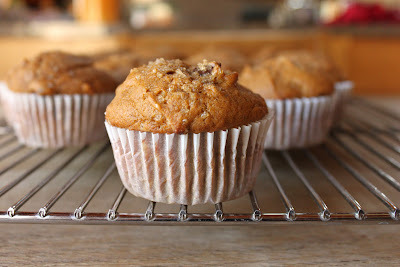 I dug into it today and made pumpkin and red lentil soup, pumpkin chili, and these pumpkin chocolate chip muffins. This pumpkin chocolate chip muffin recipe is based on a pumpkin bread recipe I got many years ago from Brenda, my college sweetheart's mother. She taught preschool and made pumpkin bread with her class every year. Under the ingredient list on the original recipe card I wrote "Mix everything together - no sifting." I did it that way for years and then had a bad experience with some clumps of baking soda, so now I do actually sift. But according to Brenda, it's optional. I got a new camera last week (thank you, husband) and used it to take these photos. What do you think? I think I still need some lessons. Preheat the oven to 350 degrees. Line a 24-cup muffin tin or two 12-cup muffin tins with paper liners. In a large bowl, mix together the pumpkin puree, eggs, oil, 2 1/2 cups sugar, vanilla, spices, and salt until everything is well combined. Hold a sifter or fine-mesh strainer over the bowl with the pumpkin mixture. Add the flour, baking powder and baking soda to the sifter, then sift the dry ingredients over the wet. Whisk gently just until the flour mixture is incorporated. Add the chocolate chips and stir to combine. 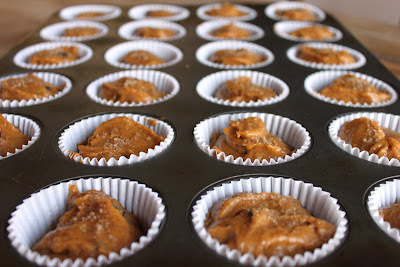 Fill the muffin tins most of the way up, dividing the batter evenly. Sprinkle the tops of the muffins with the remaining 2 Tbsp sugar. Bake about 25 minutes or until a tester comes out clean. Remove the pan from the oven, let the muffins rest 2 minutes, then turn the muffins out onto a rack to cool. One-pan chocolate cake recipe, also known as "wacky cake"
Every once in a while - okay, truth be told, once a day or so - I get the urge to bake a cake. Despite my weeks of practice decorating cakes last winter before my big day with Kelly Ripa and the Cake Boss, I prefer plain cakes. 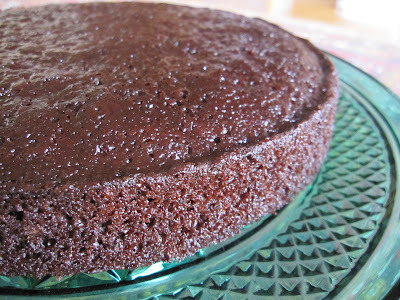 Which is why, when I saw this one-pan chocolate cake on the King Arthur Flour blog, I knew I had to make it. 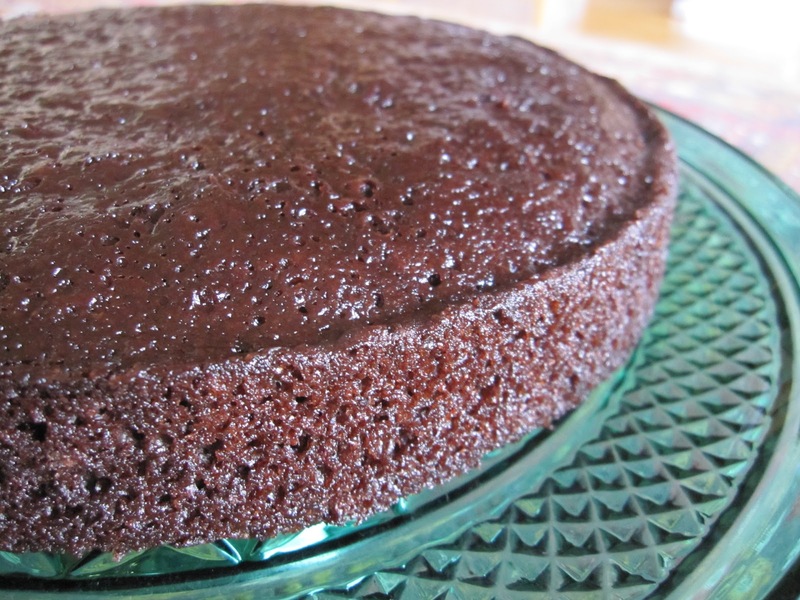 Another advantage to this chocolate cake: The basic recipe is vegan. It gets its lift from the combination of baking soda and vinegar. No eggs! My 8-year-old has a friend with a severe egg allergy. I'm remembering this one for their next playdate. 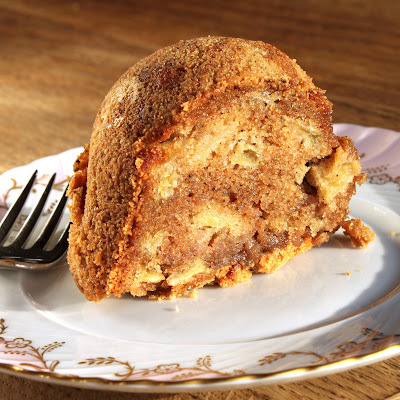 And the texture of the cake is beautiful: light, spongy, but extremely moist. I served it plain, but for those of you with the patience to frost and decorate, make two and slap them together. King Arthur gave me permission to share the recipe here, but I strongly suggest looking at their version of the "Wacky Cake" recipe, too: They've got great step-by-step photos and a few suggested variations. By the way, King Arthur, someday I am moving to Vermont (as I've said before, Vermont is in my DNA). And when I do, I want to come work at King Arthur. Okay? Glad we're straight on that. Spray a 9-inch cake pan with cooking spray. Put the flour, sugar, cocoa powder, salt, baking soda, and espresso powder into the pan and whisk them together with a fork or whisk. Make three wells in the top of the dry ingredients and add the vanilla, vinegar and oil to the wells. Pour 1 cup cold water over everything, then mix with a whisk until smooth. Bake 30-35 minutes or until a toothpick comes out moist but clean. When my kids were younger, our wonderful nanny Mirna would occasionally make some of the Guatemalan recipes she missed from home. Once she fried up rellenitos, little dumplings of mashed plantain stuffed with sweetened black beans. Everyone loved them, especially my husband. For some reason I've been thinking about those rellenitos - in fact, I almost made them for the second Project Food Blog challenge. (I decided on gesztenye palacsintak instead - Hungarian crepes filled with chestnut puree and topped with chocolate sauce.) 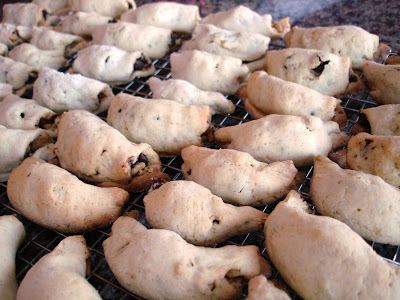 I confirmed the recipe with another Guatemalan friend, and then yesterday I made a small batch of rellenitos as a test. Basically, it's a two-ingredient dish. 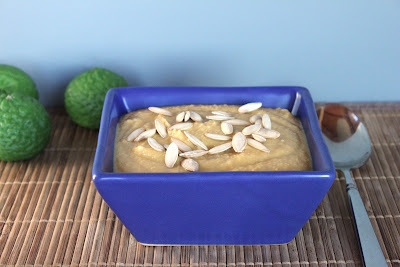 You boil some plantains in their skins, then mash them in a bowl. You mix a little sugar and a little salt into cooked black beans and mash those too. Then you scoop up a patty of the plantain, put a little dollop of beans in the middle, close it up, and pan-fry it in oil. They tasted great, but I had a little trouble with the plantains. They were loose, almost watery, and I found it hard to form the patties. I suspected my plantains had been too ripe and sent a message to Mirna. I was right. You want them only sort of ripe, she said. Not green. Not black. Still starchy. They'll be sweet enough. So take that as a warning: Don't let your plantains sit on the counter too long. But do try making these rellenitos, because they're fantastic. They're traditionally served dusted with powdered sugar; I didn't bother, but I bet it would be great. Cut the ends off the plantains. Leaving the skins on, put the plantains in a pot and cover with water. Bring to a boil, then boil about 15 minutes. 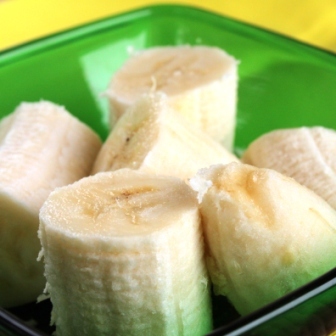 Remove the plantains from the water, let cool a few minutes, remove the skins, and put the plantain flesh in a bowl. With a fork, mash the plantains until smooth. In another bowl, mash the black beans with a fork. Add the sugar and salt and continue mashing until the mixture is almost smooth. You want this to be stiff, not soupy; if it's too loose, add some more beans to stiffen it up. 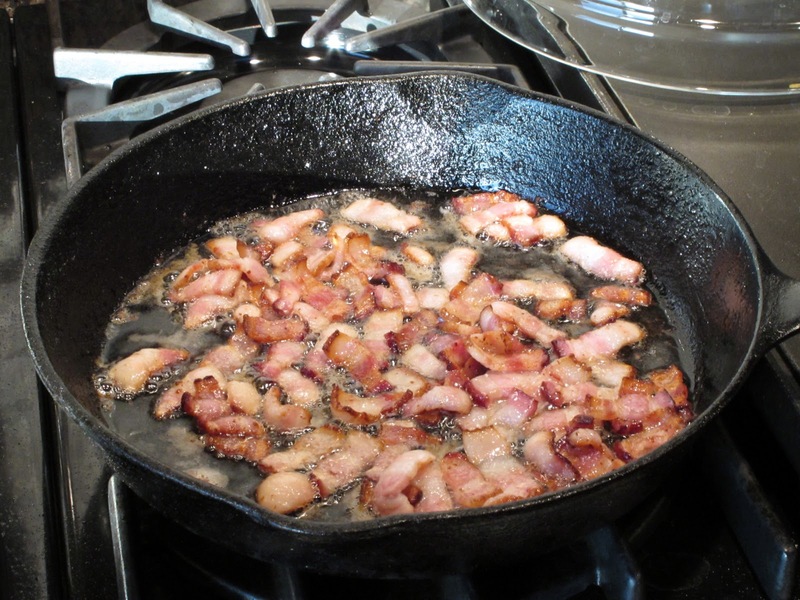 Put a large skillet over medium heat. Add enough oil to cover the bottom of the pan generously. Form the rellenitos: Wet your hands, grab about 2 Tbsp of the mashed plantains, and flatten into a thick patty in your palm. 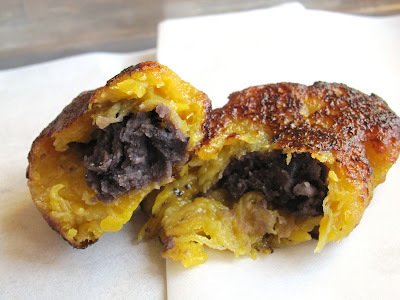 Put about 1 tsp of the black bean mixture in the middle of the patty in your hand, then gently fold the edges over so they meet and the black beans are enclosed in the plantains. Gently place the rellenito into the hot oil. 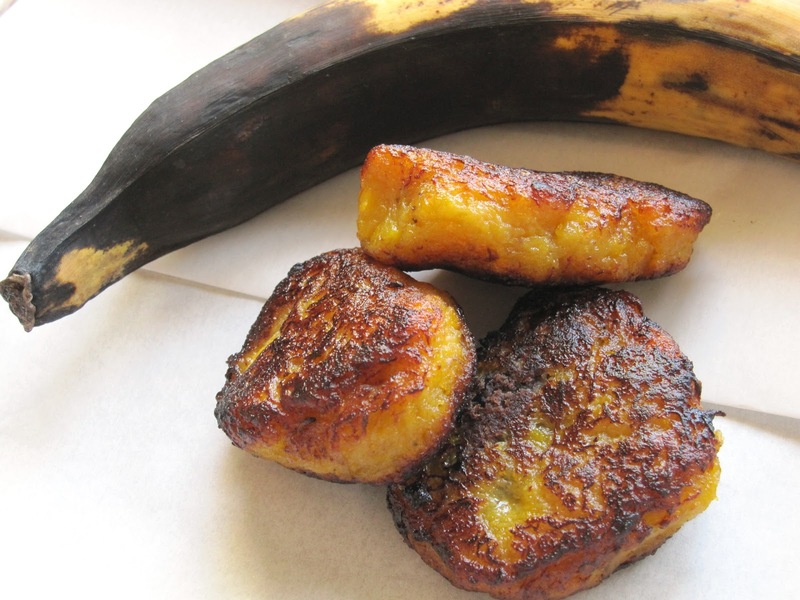 Continue with the rest of the plantain mixture, frying each rellenito on both sides until golden brown. Drain briefly on a plate lined with paper towels, sprinkle with powdered sugar if you like, and serve immediately. Makes about 12 rellenitos. Note: You may end up with extra black beans. They're also extremely good inside a quesadilla, even sweetened. 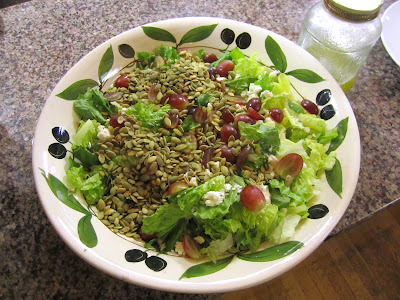 This is my entry for the third round of Project Food Blog, Foodbuzz's contest to find the next food blogging star. Today's challenge: Host a luxurious dinner party. I'll let you know when the voting starts - and thanks to all of you who've helped me get this far. Thanks also to Nathan Janos for his beautiful photos. The luxurious dinner party: I've thrown my share. Our annual Trufflepalooza, which this July featured 13 truffle-laced courses for 70 people, certainly qualifies. We use mismatched vintage china, linen cloths, antique crystal and sterling. Every course, from risotto to creamy corn soup to filet mignon, is topped with a thick layer of freshly grated Italian black summer truffles - decadence in each bite. We pour champagne, wine, Port for hours on end. It's a lot of work, but rewarding. I hope it's a summer tradition my kids remember forever. These days, in the throes of a new school year and a new role at work, my luxury is time. Getting home early enough on a weeknight to make a proper dinner for my family. Stealing a few minutes before work to bake a couple dozen muffins to hand out at my office. An evening when I don't have to go to back-to-school night, work late, raise money for my kid's youth orchestra, or wax enthusiastic about my alma mater at the college fair at a nearby high school. An evening when we can sit down to dinner and eat without constantly checking the clock and calculating how to fit in the remaining homework, violin practice and personal hygiene before bedtime. That's why Friday dinners are my luxury. 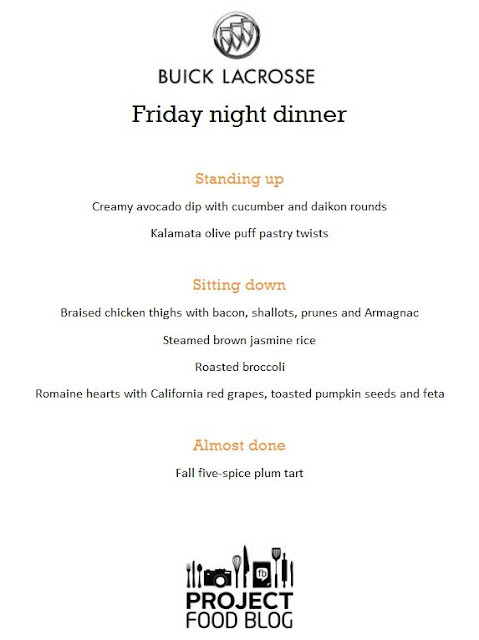 Friday dinner ends the week the way punctuation ends a sentence: definitively, assertively, making clear the difference between the busy week past and the more relaxed weekend ahead. We invite friends with kids and without; married couples, dating couples, singles; old, young, and everywhere in between. I'm sure there are those who consider "luxury" and "kids" mutually exclusive. I think having the kids join us for dinner is the best part. We get our grownup time after they finish eating and run off to play. But while they're there, we all reconnect after a long, busy week. Also, they crack me up. In general, we have an open-door policy when it comes to dinner. We issue invitations freely and spontaneously to those we know well and, often, those we'd like to know better. I'm lucky to have married a man who likes a crowded table as much as I do. 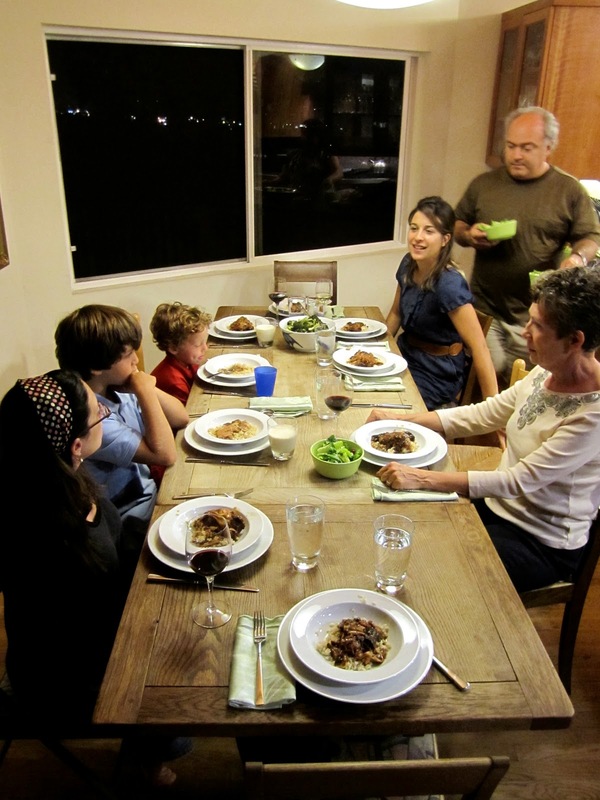 I grew up in a house where the same four people had dinner around the kitchen table every night, week in and week out. I'm glad my kids have grown up with so many different personalities dropping in to share a meal in our home. Dinner for a crowd on a weeknight is a challenge, even on a Friday, when I can usually leave work an hour or two early. I use my early mornings well, and I plan menus around easy prep. Any recipe that requires more than 10 ingredients or more than two pans will not make it onto the menu, no matter how tasty it sounds. And I don't mind subjecting guests to experiments. 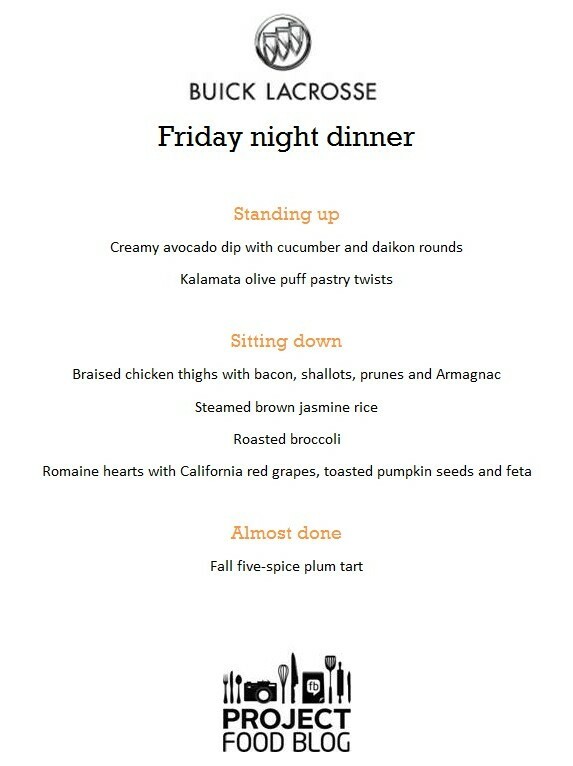 I want Friday dinners to be comfortable, not fussy. I'm not looking to impress. A few Fridays ago a friend from work came to dinner with his girlfriend and his mother. Interesting, the way it happened: I'd never had an opportunity to work directly with Nate, an MIT alum who does something I'll never understand involving algorithms and higher math, but he came by my desk from time to time to chat about food and ask for recipes. Then, a few months ago, he emailed: "So what does it take to get an invitation to dinner in Erika's kitchen?" I was flattered. We set a date. I also invited Arianna, a wine writer, and her five-year-old Z. "He's adorable," said Emery, my 11-year-old, when I told him Z was coming to dinner. Z, apparently, was just as pleased: "I love going to the big boys' house!" he said when Arianna told him of the plans. 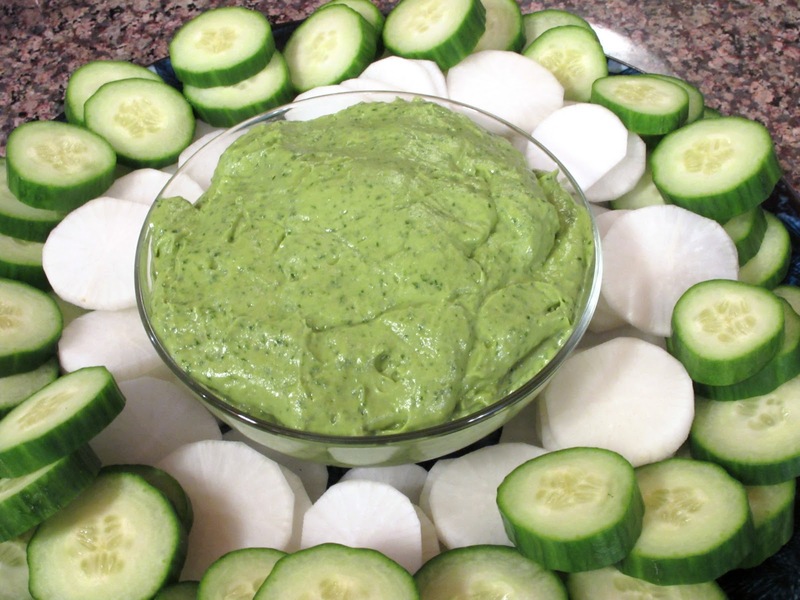 I always put out cut-up vegetables with dip before dinner. My theory about feeding kids: The more vegetables you put in front of them, the more they're likely to eat, especially if chips are not an option. We started with circles of English cucumber and daikon radish, with a bowl of the avocado spread a Guatemalan friend taught me to make long ago. It's just avocados, cilantro, lemon and salt, blended smooth in the food processor. I also pulled a box of puff pastry from the freezer and spread it with tapenade (olives, fresh basil from the garden, and garlic), then cut it into strips, sprinkled it with grated Parmigiano-Reggiano, and threw it into a hot oven. 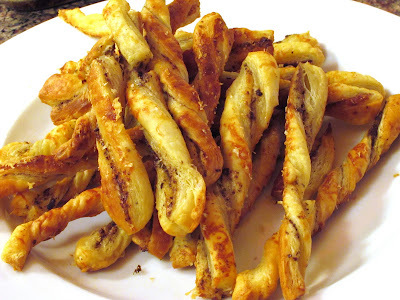 Crispy, salty, buttery, they went perfectly with the first glasses of wine. We sat down to chicken thighs braised with bacon, shallots, prunes and Armagnac, another opportunity to experiment on friends. Recently I acquired a slow cooker, and I want to love it - I'm trying. Friday night dinner seemed the perfect time to give it another chance. The carpool picks my kids up for school quite early, so after they leave the house I've got at least an hour before I need to be out the door. 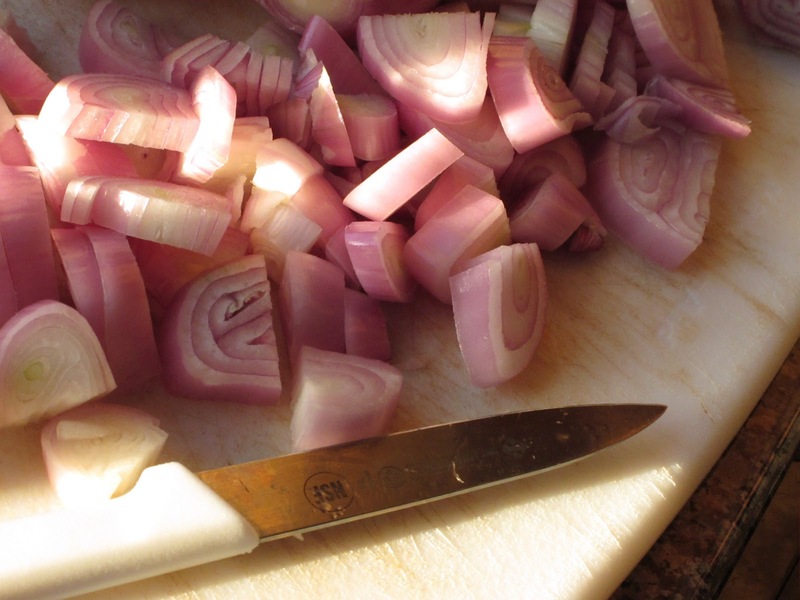 That Friday I chopped the shallots while the kids ate breakfast. 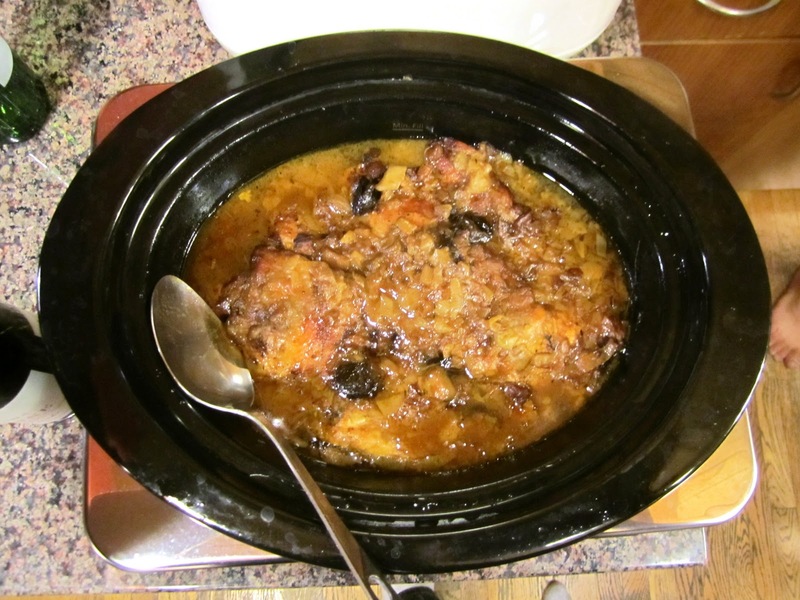 When they left, I used my hour to cook the bacon, brown the chicken, saute the shallots, and dump the whole mess in the slow cooker with some dried prunes and a splash of Armagnac. When I got home from work late that afternoon and lifted the lid, the smell made me smile. We ate the rich braised chicken over brown jasmine rice, and with that I served broccoli, roasted in a hot oven and topped with grated cheese. I always make a green salad, which this time included hearts of crispy romaine, halved red grapes, crumbled French feta, and toasted pumpkin seeds, tossed in a mustardy French-style vinaigrette. We ended the meal with a simple plum tart, which I put together while everyone was arriving. I use the same crust, a simple press-in dough made with olive oil, for both savory and sweet tarts. It's adapted from a recipe in Amanda Hesser's Cooking for Mr. Latte, one of my favorite examples of the "cookoir" genre. 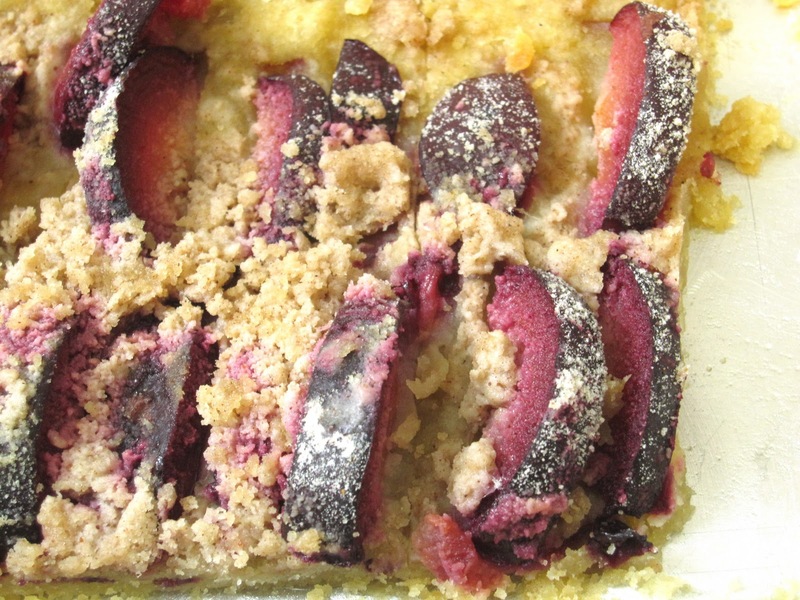 I sliced late-season purple plums and arranged them over the crust, then mixed sugar, butter and a little flour with Chinese five-spice powder to sprinkle on top of the fruit. Here's one thing you should know about me: I'm a bit of an exhibitionist. No raised eyebrows, now. What I mean is that I really like to cook with spectators. We have a good kitchen for it. I work at the long granite-topped peninsula that separates the kitchen from the dining room, then clear it off and put out the food so guests can serve themselves before sitting down. I can be in the kitchen and at the party at the same time - my favorite combination. If you're in southern California and find yourself free on a Friday night, whoever you are, drop me a line and drop in for dinner. Nothing would make me happier.